K K Luthra Memorial Moot Court Competition is one of the most prestigious moot in the country.Since 2005, the Competition has been held annually at the Campus Law Centre premises in the memory of Late Sh. K. K. Luthra, Senior Advocate, an eminent criminal lawyer, whose legal career spanned from 1949 till his demise in 1997. This is the only international Criminal Law moot court competition in India. The Competition has focused on topical legal issues and subjects ranging from medical negligence, information technology and cyber crime, unlawful activities and terrorism, online banking fraud, International Criminal Law and genocide, impeachment of Judges of the International Criminal Court, Narcotics, Trial by Media and Defence Entrapment and related issues in criminal jurisprudence. The last 5 editions of the Competition has seen participation from over 60 Universities as also participation from International Universities such as Fitzwilliam College, Cambridge, Northumbria University Law School, University of Warwick, Bangor University Law School, United Kingdom, The George Washington University Law School, USA, Universitas Gadjah Mada, Indonesia, Pakistan College of Law, Pakistan, Sri Lanka Law College, Sri Lanka, Kathmandu School of Law, Nepal, London College of Legal Studies (South), Bangladesh and Hankuk University, South Korea. The moot was held on 17th January 2016, held at Campus Law Centre, Delhi University, New Delhi. 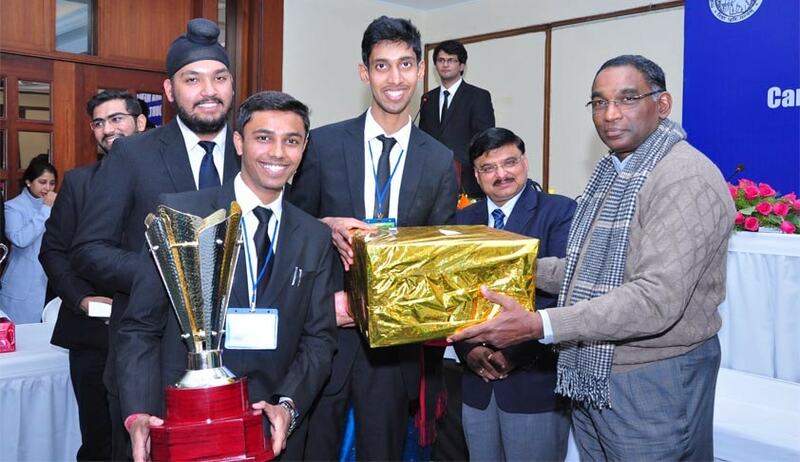 The National Law School of India University team comprising Utkarsh Sonkar, Nicky Collins and Harpreet Singh Gupta defeated the team from George Washington University Law School in the final round to win the 12th KK Luthra Memorial Moot Court Competition. The team also won the prize for the Best Memorial. LiveLaw: How do you feel after such a big achievement? Team: It has literally given us some major adrenaline rush. It’s a lifetime experience, a moment to cherish and appreciate everyone/ everything that led to this. We feel humbled after this achievement and express our gratitude to our parents for their unending support, to our professors and friends for helping us. It has rejuvenated our spirits and we are looking forward to more mooting experience. LiveLaw: What was your motivation behind opting this moot? Why did you decide to do this moot? Team:The problem being premised on Constitutional and Criminal Law was the dominant motivation behind opting this moot. All the team members have keen interest in these subjects. Apart from our interest, we knew that K.K. Luthrais one of the best moot court competitions in India which offers a challenging moot proposition and high quality judging. LiveLaw: What is the most important thing you learnt while preparing the memorial and in the oral rounds? Team:First principles are the foundation on which thearguments are premised. Hence, it is not just the authorities we use but the underlying rationale behind the proposition that is made and linking it to the context of our moot problem. This can only be achieved after having a firm hold over the first principles. The research apart from being holistic in nature should also analyze the position of law from various angles. This helps not only in having a better written memorandum but also impresses the judges in the oral rounds. Team: The toughest part was time management since we had only around 25 days for preparation of the written memorandum as we were offered this moot in the last week of October and the submission was scheduled on November 17. This later got extended to November 23. LiveLaw: Did any one of you feel like giving up at any point of time? If yes, how as a team you use to motivate each other? Team: The day we were offered this moot, we knew that we do not have much time. Accordingly, we started with a mindset of giving our best shot. Frankly, owing to the paucity of time, we were so engaged in the moot proposition that the thought of giving up never crossed our minds. Also, since we had keen interest in the subject matter of moot proposition, it just acted as a catalyst which motivated us to work. Nothing can be better than doing what you love. Two of team members, namely, Utkarsh and Harpreet already had mooting experience which gave the team experience and confidence. Also, the thought of winning the most prestigious moot court competition of our country kept us motivated at all points. LiveLaw: How did you come up with such a fantastic team? Team: The teams for all the moot court competition in our University are based on ranks in the intra University moot court rounds. Therefore, the team was not pre-decided. As luck would have it, we ended up with this team and developed a firm bond which strengthened with time as well as working together. LiveLaw: What pattern did you guys adopt for preparing the moot competition? How did you guys divide your work? Team: There were 4 issues in the moot proposition delving with a specific area of law. We divided these issues amongst ourselves and kept deadlines to which each one of us had to stick. LiveLaw: What strategy the team made to prepare for the moot? Will you be changing the working strategy for the final rounds? Team: The strategy with respect to Memorandum was fairly straight forward. Working hard on our issues, bring up logical arguments backed with authorities, trying to make some novel arguments, sticking to deadlines, giving ourselves ample time to check our work and plugging in any flaws. The strategy with regard to oral rounds was to never lose our calm, being cogent and concise. Our strategy changed post the preliminary rounds (credits to the CNLU team in the Octa-finals which made us realize this). We realized that our arguments in the second issue dealing with the issue of joinder of person was significantly better than some other teams which had either erroneously misconstrued the issue or missed some material arguments. Provided the first issue dealt with constitutionality of the Secrets Act and was convoluted, we decided to put forth our second issue first. This definitely was the best strategy which helped us sail through thecompetition. LiveLaw: Was drafting the memorial more hard or preparing for the orals rounds? How did you prepare for the oral rounds? Team: Drafting a memorial and preparing for oral rounds though different aspects of mooting are nevertheless complementary to each other. If you research is weak, it is highly unlikely that you do well in oral rounds. It is also true that no matter how good your research is, if you are unable to put it across from the podium to the dais, you won’t succeed. Hence, communication of the research to the judges becomes pivotal. Our preparation for oral rounds entailed giving practice rounds to our fellow students in college. We gave rounds even to people who were not well conversant with our problem. This becomes crucial as while you are working for a significant time on a moot proposition, you end up using a lot of technical terms in an assumption that the person before you is appreciating it. This helps us in simplifying our arguments which makes them more communicable. Apart from this, we gave rounds to people who are generally very good in the subject matter of the moot proposition and are conversant with the problem. They grilled us, guided us and ensured that we plugged in all the loop holes in our arguments. LiveLaw: How much contribution would you like to attribute to your professor/ college over this achievement? Team: Our professors/college have played a significant role in our achievement. The firm grip that we had over first principles was clearly attributable to our professors. Apart from this, our college has adopted a liberal approach towards the students preparing for moot court competitions. They go beyond the ambit of black letter law of rules and regulations and help us in situations. Citing an example of the same, our team member, Utkarsh was entitled to a First Attempt in examination provided our memorial submission was two days post the examination. Owing to the extension of deadline, the same became four days post the examination. The examination rules propose a three day time frame for the same. However, setting aside the technicality of the rules, our Vice-Chancellor permitted the First Attempt. This encourages us to give our 100% in competitions provided the college always takes our back. Team: We always have had keen interest in Constitutional and Criminal law. Hence, the mindset remains the same. Though, this moot has provided us with a thrilling experience, which would definitely mold our ways in the future. Team: We have a trimester system which is pretty intense. Balancing our academic performance with preparation of moot made uswork for extra hours. Regarding our internship, it remained unaffected as the competition ended prior to the starting of our internship break. LiveLaw: How many months prior to the moot competition the team started its preparation? Team: We had around 25 days to prepare our written memorandum. Regarding our oral rounds, we started our preparation 15 days prior to the competition. Team: We worked quite well as a team because the three of us coordinated well. We allocated issues to each member of the team depending on their interest vis-à-vis the issues. Our team’s forte was our collective grip of the basic principles of Criminal Law and Constitutional Law. The major roadblock was to find the most prevalent position of common law as some countries had opposing positions of law. Additionally, the issues were framed in an ambiguous manner, for example, the constitutional law issue.Therefore, pinning down the central question in the issue and structuring arguments became challenging. LiveLaw: Which area of International Criminal Law wasthe moot question based on? Team: The moot proposition engaged in Constitutional and Criminal law question. The Constitutional aspect related to the tussle between the transparency and secrecy regime vis-à-vis the interests of the State. The moot proposition entailed both procedural as well as substantive questions based on common law. The substantive part related to offences of corruption, theft, cheating, trespass, etc. The procedural part related to joinder of personsand law on stay of proceedings. LiveLaw: Does speaking/ oratory skill really matters or the research alone will suffice to get through the moot? Team: It is the combination of good research and oratory skills that can get one through the moot. You have to put you research across from the podium to the dais in a cogent fashion to do well in a moot court competition. Team: There were around 55 teams in the competition. We faced 6 teams in our journey through the competition. We believe our toughest competitor to be CNLU, Patna in the Octa-finals. They made us aware of the advantages of arguing the second issue first and had pretty similar arguments which they presented in a very structured manner. LiveLaw: What do you think got you success to reach to finals? Team: It was the result of the hard work put in research, along with examination from the problem from every possible angle, being open to unorthodox arguments and putting the arguments across effectively to the judges while maintaining our calm. Further, as luck would have it each unorthodox move that we decided to take, proved to be advantageous, for instance, arguing the second issue first in the qualifiers. Team: This statement is completely justified as the quality of oral submissions is nothing but the reflection of research in the memorandum backed by court mannerisms and eloquence. LiveLaw: What message would you like to pass on to the mooters and the non-mooters out there? What is your advice to someone who has never mooted before? Team: To mooters,if you want to ace moot court competitions, first, have a firm grounding of the first principles, secondly, research from every possible angle, third, be a bit unorthodox and finally, put across your research from the podium to the dais with a lot of self-belief and confidence (and believe us, this requires a lot of practice). To non-mooters, mooting is an experience that you will cherish throughout your life. Give it a shot. It will expose you to the nuances of litigation, particularly, argumentation. May be you end up falling in love with it, as we have.